The topic of last year's conference was: The Situation is Heating Up - Change is Needed! There are several problems, which literally lead to a heated atmosphere on our planet. But beside climate change we discussed other problems like humanitarian, security and legal questions as well as the situation of children in the world in order to find suitable solutions for those issues. On 22nd and 23rd of November we liked to welcome you at the 2018 annual MUNelly conference at Nelly-Sachs-Gymnasium in Neuss, Germany. If you want to join MUNelly 2019, please send us an e-mail to munelly@gmx.de. Please stay tuned to our website and Instagram-Account to be the first to receive the latest news. The MUNelly 2019 staff is looking forward to welcome you to this year's conference and we hope that we will have two interesting, productive and exciting days together. Let us be the change that is needed! On Saturday, March 11th, the MUN-Projektkurs and the AG took part at the MUNLR-conference (Model United Nations Lower Rhine) in Neersen. The conference was hold in a castle. After registration, the Secretary Generals opened the conference. During the opening ceremony a member of the German medicine-aid organisation “action medeor e.v.“ gave a speech highlighting the importance of medical maintenance in Africa and how “action medeor“ is taking a step in the right direction.Afterwards the chairs demonstrated the basic rules of a MUN-conference and what one should never do with the help of a very humorous mock debate. Once the opening was over, the discussions in the individual committees started. The topics included healthcare, neocolonialism and land management, wildlife trafficking and battling terrorism. After many heated discussions, excellent food and live performances by an African bongo-band, the conference already ended. All in all it was a very enriching experience and all delegates had lots of fun. Of course we would be delighted, if the hosting schools of the Neersen conference attended our conference as well. On 15 June 2016 the MUNelly-Team, which consists of participants of our MUNelly Conference in 2015, visited the UN-Campus in Bonn. Shaping a sustainable future is the major issue of 18 organisations and over 1000 staff members whose intention is to help government and people to find answers and ways to achieve a sustainable future on the planet. We were welcomed by Harald Ganns, senior advisor of The UN and former German ambassador. Our main interest were peacekeeping operations and the UN responsibility to protect (R2P). We learnt that the major task of the UN is to guarantee safety for the people in their countries of origin and that blue helmet troops are formed on demand. 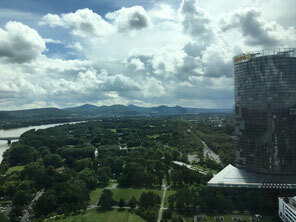 Afterwards we went up to the 29th floor and enjoyed the breath - taking view from the top of the building “Langer Eugen” over Bonn and the Rhine valley. A guided walk introduced to us the “Path of Democracy” and made us familiar with the governmental district of our former capital Bonn. After a quick visit to McDonalds the excursion ended. All in all, it was a splendid experience!